The Florida Department of Transportation Transit Office has been at the forefront in the development of state-of-the-art transit planning software tools. 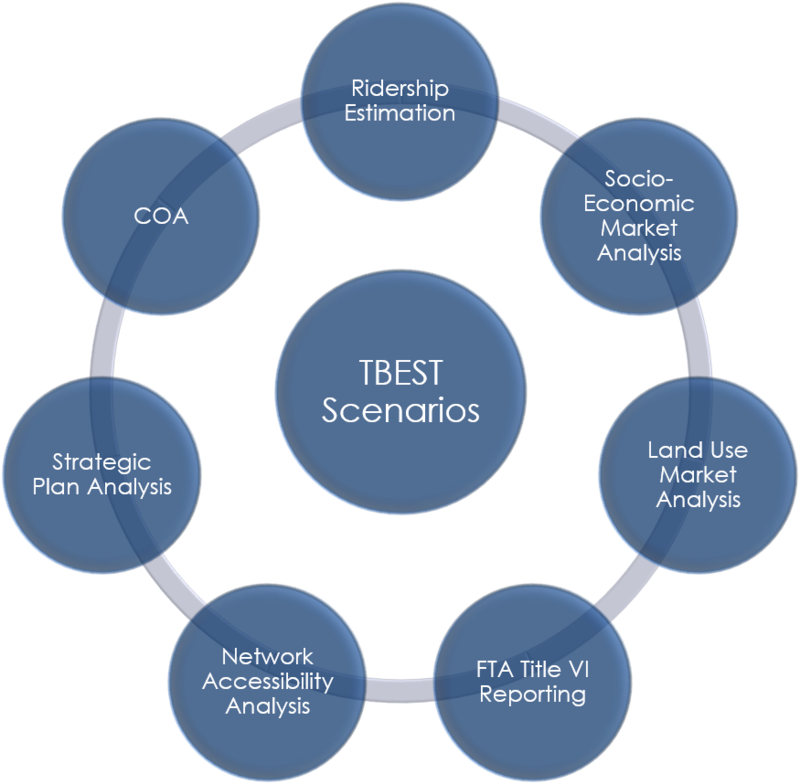 TBEST, or Transit Boardings Estimation and Simulation Tool, represents an effort to develop a multi-faceted GIS-based modeling, planning and analysis tool which integrates socio-economic, land use, and transit network data into a unique platform for scenario-based transit ridership estimation and analysis. TBEST contains a modeling structure which allows flexibility in model calibration, validation and application including Bus Rapid Transit (BRT) ridership forecasts sensitive to a range of implemented characteristics. TBEST ridership estimation models simulate travel demand at the individual stop-level while accounting for network connectivity, spatial and temporal accessibility, time-of-day variations, and route competition and complementarity. TBEST provides an interactive tool to import and export GTFS based transit networks. Users can import entire GTFS route networks or select individual GTFS routes to replace existing TBEST routes. TBEST GTFS export will output a TBEST current year or future year networks into GTFS format with additional files containing TBEST stop amenities and ridership forecasts. What organizations can utilize TBEST? Local Transit Agencies, Regional/Metropolitan Planning Organizations, State and Federal Departments of Transportation, Research Organizations, Universities, Private Planning/Engineering Firms. Is there a fee to use TBEST? TBEST is a free software and only requires that a licensed version of ArcGIS is installed on the target machine.